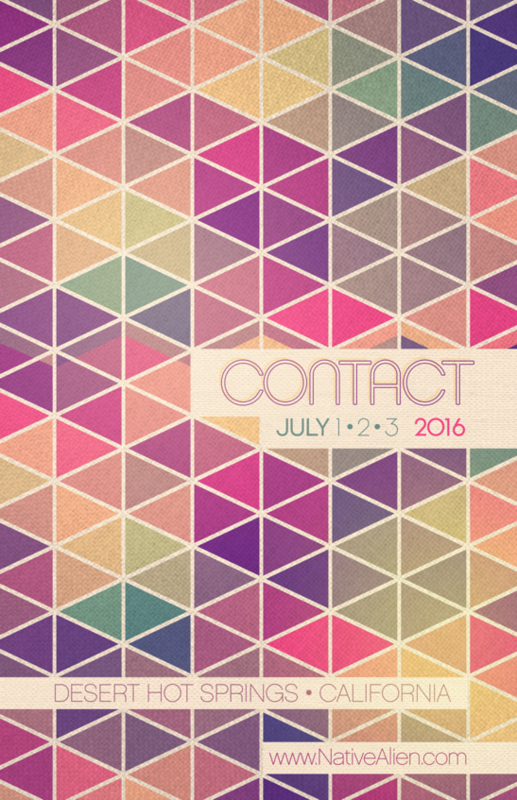 Native Alien presents CONTACT 2016 at Miracle Springs Resort & Spa in Desert Hot Springs, California, July 4 weekend. This is our 5th annual gathering, and we are excited to bring this event to a bigger and better venue. Join us for an unforgettable, therapeutic music adventure. CONTACT is a unique opportunity to revitalize for 4 days and 3 nights poolside, with a variety of renowned international Techno and House music DJ’s, and guest performers. Aimed at uniting people with a common affinity for electronic music and culture, CONTACT is an immersive music experience, and a chance to reset and reconnect. Guests can look forward to interactive games, afternoon pool parties, and an indoor disco main stage at night. The main pool, and seven therapeutic hot spring-fed sauna pools will be open 24-hours for hotel guests. With sound by Pure Groove Systems, CONTACT is a ‘vacation’ of sorts from the typical multiple day camping festival. Our new hot springs venue allows us to expand on the resort idea with daytime pool parties and a disco each night. The resort life never sounded so good! Don’t miss out on this intimate weekend-long vacation with Native Alien. CONTACT Tickets are not included with the hotel reservation and must be purchased separately. Purchase 4 Weekend Passes for the price of 3 now. That’s one more friend that can join the party! Buy more than 4 at once and get Weekend Passes for $125 each! We can’t wait to soak in the desert sun, and splash in the spring water with all of you. Bring your positive vibes, and see you on the dance floor! Book Your Hotel Room For Contact! To book your room, call Miracle Springs at (760) 251-6000 and ask for Krystal! Pleaes mention you are with “The Contact Group” when making your reservation. Our group room weekend rates range from $109-$139 per night plus taxes for standard, pool view and mountain view rooms. Pool side rooms, mini suites and deluxe suites are limited and also available. Awesome!! I go here twice a year – great venue!! TIckets are for sale now Matt! Check out this post for more info: http://www.nativealien.com/contact/ we just sent out our email today! See you there! Did they not want us back in Mexico? Loved it there.